Juventus sporting director Fabio Paratici has confirmed that the Turin giants are interested in Aaron Ramsey while dismissing talk of a Massimiliano Allegri exit. The Bianconeri remain on course for an eighth consecutive Serie A title this season as they are still undefeated and boast a healthy lead at the top of the standings, while also advancing to the knockout stage of the Champions League. Success in Europe is now the only missing piece under Allegri, but as they look to maintain their dominance domestically and go that extra step in Europe, the hierarchy seemingly continue to consider ways to strengthen the squad. Perhaps with Blaise Matuidi and Sami Khedira not getting any younger, midfield reinforcements are a priority and with his Arsenal contract set to expire at the end of the season, Juventus could swoop for Ramsey in another smart business move to follow on from the free signings of Andrea Pirlo and Paul Pogba in recent years. “He’s a great player, he’s been at a great level for years and he’s playing in a great team, his contract is expiring and we’re always careful about these situations. This is all to be decided, but for now he is an Arsenal player, we are certainly not the only ones in the market for him,” he is quoted as saying by Sky Sport Italia. Time will tell if they can successfully convince the 27-year-old to move to Turin, but as noted by the Guardian, Ramsey has publicly conceded that the Gunners have taken their contract offer off the table and so he remains likely to move on in the summer. 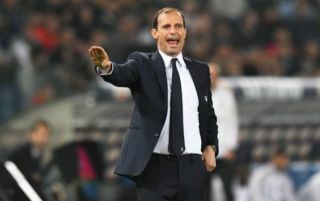 As for Allegri, ESPN have noted that Man Utd will consider him as a long-term appointment in the summer after sacking Jose Mourinho last month. Ole Gunnar Solskjaer is in temporary charge, but with a need to bring in a top class tactician with experience and winning pedigree, Allegri’s name has been linked with the post. Paratici though has insisted that he doesn’t envisage a situation in which the Juventus boss leaves Turin any time soon, despite the fact that he has seemingly done it all with the club over the past four years aside from winning the Champions League. “I am sure he will remain for a long time, he is the best coach possible for Juventus and the team is right for him,” he added. It remains to be seen if he does stay on if Juve go all the way in Europe this season, as it could be argued that he might be more inclined to consider a fresh challenge with United posing a serious yet appealing one given their recent plight.